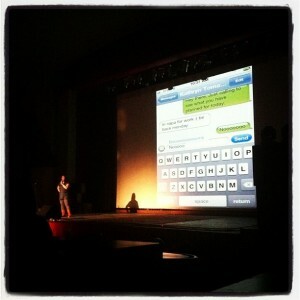 Speaking at Ignite Denver 13. Photo by ideavist. SXSW V2V – guest post about my SXSW V2V 2013 experience and what I looked forward to in SXSW V2V 2014. I was an Advisory Board Member for SXSW V2V in 2014. Hiscox Small Business – guest post regarding the benefits of attending SXSW for small businesses; posted on March 25, 2014. Grow Southwest – guest post with a recap of SXSW 2014; posted on March 20, 2014.
the3six5 – A 365 group blog for 2010. I wrote my blog post on April 24, 2010.
i live here:SF – A photo/essay blog written by residents of San Francisco. I was featured in October 2009. All Things Cupcake – A community blog about all things cupcake. I contributed posts in early 2009. #VSS Anthology Volume 1 – “VSS” stands for “Very Short Stories”, a project of short tweets bound together in an e-book. Ignite Denver 20 – I presented about the top lessons I learned while working as a hot dog vendor in San Francisco in 2008. The Ignite Denver show was in June 2015. Ignite Denver 13 – I presented about how using spell-check won’t save anyone these days in February 2013. Ignite Denver 11 – I spoke about growing up Asian-American at Ignite Denver 11 in June 2012. Launch Top Tweeter – Infographic on Launch 2013; I’m featured as top-tweeter! Asian Avenue Magazine – I was one of 10 Asian-American singles in the Denver Metro Area for 2012.